Wishing You A Safe & Spooky Halloween! Boo who? Don’t cry – we’re just wishing you a Happy Halloween! Fall has officially sprung into full gear, which always marks a very busy (and exciting!) 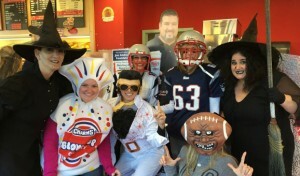 time of year for us at the Joe Andruzzi Foundation! We’re just a few weeks away from our signature fundraising event – the Gratitude Gala – and we can’t wait to celebrate with you all at Gillette Stadium once again. We’ve also been busy filling out our 2016 Boston Marathon Team JAF squad, as well as rounding out our awesome month-long campaign with Honey Dew Donuts. But that’s not everything that kept JAF busy in October – read all about the month that was below! Tickets Going Quickly For The Gratitude Gala! Our eighth annual night of gratitude and celebration returns to Gillette Stadium’s Putnam Club next month, November 16th (6:00pm) for the annual Gratitude Gala, presented by East Commerce Solutions, Inc. – and you can join us by grabbing your tickets TODAY! But move quickly because, before you know it, we’ll be sold out! We also want to thank the amazing supporters who have had such an important role in helping to make the event possible: Presenting Sponsor East Commerce Solutions, Inc., as well as our Platinum Sponsors, CVS Health, The Kraft Group, and Takeda Oncology. To purchase tickets and learn more about the Gala, please click the link below, or visit: http://bit.ly/JAFGala2015. It’s hard to believe Team JAF’s first Marathon was almost five years ago. Since that race, more than 100 special runners have pledged to train and fundraise as a member of our Marathon team, becoming the ultimate foundation ambassadors along the way. In that time, Team JAF’s fundraising has totaled more than $950,000 over five Marathon Monday’s, and with your help, our 2016 team will cross (and go well beyond) the $1 million mark. That means our runners will have raised enough funds over six Boston Marathons to empower JAF to assist more than 1,500 cancer patients in need. And that’s why we’re looking for the best of the very best to join Team JAF for the 2016 Boston Marathon! 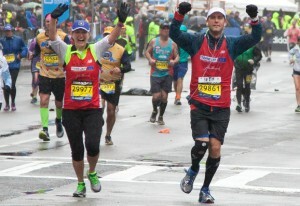 We are also proud to announce that three Team JAF Boston Marathon alumni runners will be back with us for 2016 – Amy Pepe, Matt Bernie, and John Ponte. Collectively, these three raised more than $30,000 for JAF through the 2015 Marathon, and we’re thrilled to have them back for an encore! There are only a few spots left on the team! For more information, and to fill our 2016 online application, click here to learn more, or visit: http://bit.ly/Run4JAF16. We’re so proud to once again be getting a jolt from Honey Dew Donuts, New England’s largest locally owned coffee and donut shop chain, to support cancer patients and their families. As you know, through the end of October 2015 (this Saturday! 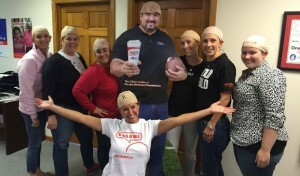 ), Honey Dew, the official coffee of the Joe Andruzzi Foundation, is selling $1 and $5 window decals, which Honey Dew will match and donate proceeds of, dollar for dollar, to JAF. Also, Honey Dew continues to sell the “(Up)Beat Donut,” available at all of Honey Dew’s 145 locations throughout Massachusetts, New Hampshire and Rhode Island. 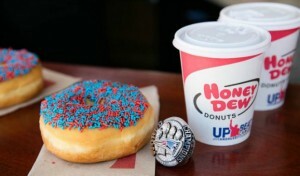 A portion of the proceeds from the specially-created red and blue-sprinkled, chocolate frosted donut will be donated to JAF. We have had so much fun looking at all of the #IFoundJoe submissions for our October social media contest – where customers have the chance to win an Apple® Sport Watch when they post a “selfie” with the life size cut-out of Joe Andruzzi found at participating Honey Dew shops and post it to their Instagram, Twitter or Facebook pages using the hashtag #IFoundJoe. There’s still time to get your photos/submissions in before Saturday – so head down to your local Honey Dew and “find Joe”! A few weeks back, we had a great group of supporters fundraise for JAF through the initiative, including the inspiring duo of Stephanie Corliss, a cancer survivor, along with her life-long best friend, Lindsay Rosa. Stephanie and Lindsay’s upbeat attitudes and generosity are such an inspiration to us here at the Foundation – be sure to check out their full story on the JAF blog. 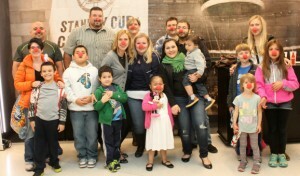 Earlier this month, the Joe Andruzzi Foundation treated a group of patient recipients to a night at the Ringling Brothers and Barnum & Bailey Circus in Boston at the TD Garden. The event – part of our ongoing series of (Up)Beat Outings – was a huge success! Many of the families in attendance have been battling extraordinary circumstances, and to provide a carefree opportunity for them to take their mind off it is something we are so proud of! A special thank you to our friends at Regan Communication for helping to set up the event! 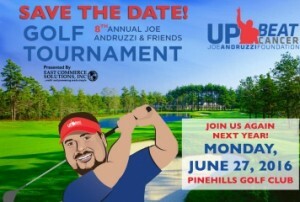 The Joe Andruzzi Foundation will return in 2016 to the beautiful Pinehills Golf Club in Plymouth, MA on June 27, 2016 for our 8th annual Joe Andruzzi & Friends Golf Tournament, presented by East Commerce Solutions, Inc. Check back in early 2016 for details on foursomes. For questions regarding sponsorship opportunities, please contact events@joeandruzzifoundation.org. Students at the Amvet Elementary School in North Attleboro took a break from their classrooms last Friday and gathered in the gym for a different type of lesson, as they welcomed Joe for a pep rally. 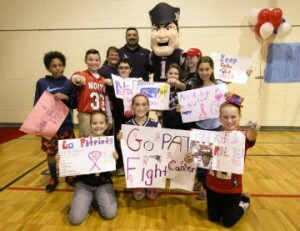 Earlier this month, students at the school participated in a “Patriots Spirits Today” event, when students who wore Patriots gear donated a dollar to the Joe Andruzzi Foundation. In total, the amazing kids – including the son of a former JAF patient recipient – raised over $400 towards our foundation. Learn more about the amazing visit, as well as WBZ-TV reporter Paul Burton’s story about the event here: http://cbsloc.al/1kVB2AM. To view a few pictures from the Sun Chronicle, click here.